The daily readings from Genesis this week, Monday-Friday, take us through a grindingly slow reading of the entire flood narrative (Genesis 6:9-8:22). I see no need to spend time on the separate daily readings from these chapters of Genesis this week. The story makes for expensive special effects in a lame Hollywood movie – though one must be fair and report that last year’s Noah was not a straight telling of the Bible story, so it was attacked by many ‘Christians’ – and I prefer to treat the entire story in a couple of paragraphs here. The only parts of this whole narrative that I can relate to are the beginning and the end: verse 6:11 – “Now the earth was corrupt in God’s sight, and the earth was filled with violence” – and 8:21, where God promises not to do this again. But in between there’s no escaping the fact that it’s universal genocide that takes place – and genocide becomes quite common in the Bible from this point on, though not on this scale. But verse 6:11 does ring true to anyone who watches the news and looks beyond what’s outside his or her window. Looking out one’s window might suffice for Sarah Palin and Senator Inhofe, but for anyone who cares about more than the “bottom line” the world is indeed in deep trouble. 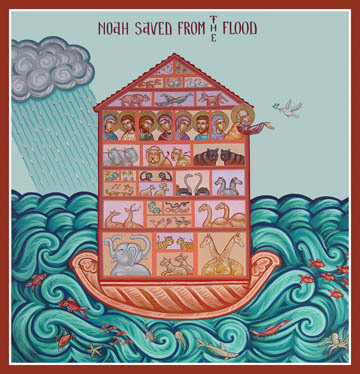 The story of Noah and the flood is myth, but it is apocalyptic myth. And apocalyptic thinking is very popular in our own age. Many Christians wait breathlessly for the ‘Rapture’ which will take them away to safety before God does his thing again and destroys everything and everyone that these ‘Christians’ don’t approve of! (I’m not exaggerating or mocking, that’s what the ‘Rapture’ boils down to.) Then you have the Islamist extremists who are hell-bent on their own versions of the apocalypse. Indeed, some years ago I had seen some books of Islamic apocalyptic literature, and the books had covers that looked exactly like the covers of ‘Rapture’ books that I would see in the local Christian bookstore! Political apocalypse is often connected to religious apocalypse, though not always. For most of the Cold War decades the fear of nuclear apocalypse did not have much of a religious overtone, except in some biblical sects. Today, far more prevalent is environmental apocalypse. While religious apocalypse tends to attract conservative-minded people, environmental apocalypse attracts liberal- and radical-minded groups and individuals. It is easy to believe any of the religious, environmental and political apocalypses; there is enough trouble in the world to feed any of these versions of global catastrophe. 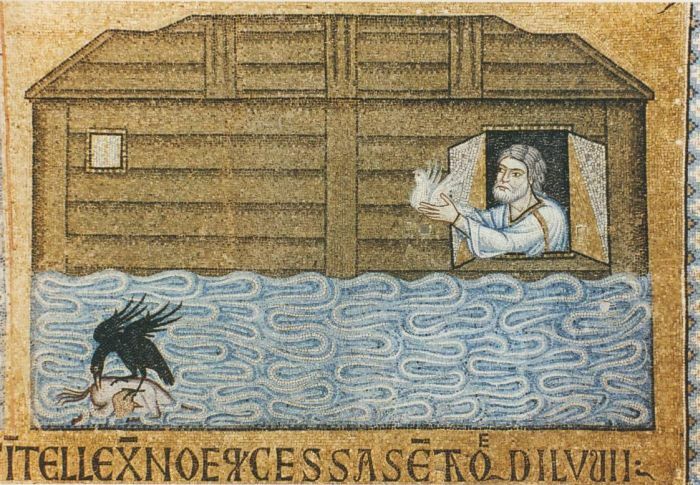 The Flood narrative can be seen as a metaphor for any of the possible apocalypses facing us. The only problem is that while humanity is very capable of creating an apocalypse on our own, the one in Genesis is caused by God who regretted creating the world and man (Genesis 6:5-7). 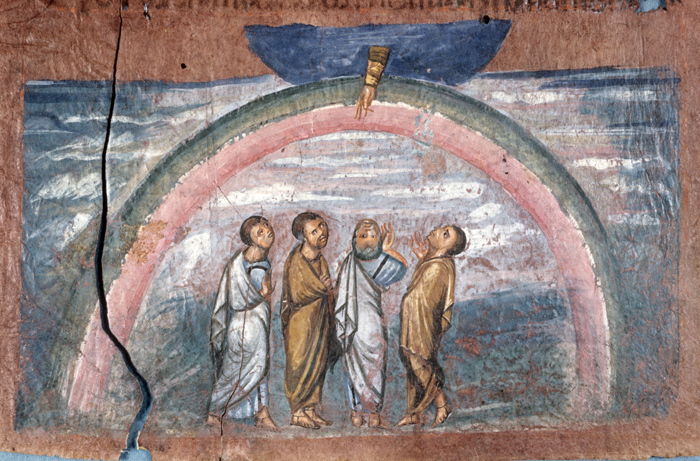 The anthropomorphic image of God changing his mind that is often presented in the Bible is difficult to reconcile with dogma of God’s unchangeable and immutable nature. But then the Bible is not a textbook of dogmatic theology. Dogmas are firmly rooted in the Bible, but the Bible itself is beyond dogma and very often contradicts or challenges established dogma! The anthropomorphic images of God in the Bible are certainly mythological to one degree or another, but they serve to underline the utter freedom of God. “My ways are not your ways,” God says in Isaiah 55:8. There’s even a place where God says he “will not change his mind” (Psalm 110:4)! The biblical texts stand before us to challenge our images or preconceived ideas of God. The Bible often makes us uncomfortable – as the Flood narrative does – but if it failed to make us uncomfortable as often as it gives us comfort, it would be of little value. I personally thank God for the honesty of the book that carries his imprimatur, so to speak. To me it says, “So you have trouble with this text? Deal with it!” So I try to deal with it the best way I can. Modern scholarship often gives me the means to see beyond mythological and/or pious interpretations. Orthodox tradition is more creative in such situations. It is just as easy to see Isaiah 7:14 in a typological sense as it is to see it in prophetic/literal sense. Is it a cop-out on our part? Not really. Typology recognizes the spiritual unity of the Bible; it honors the spirit more than the letter. Certainly the Fathers of the Church believed in the literal sense, and also in the typological sense. Today we have scholarship that makes literal interpretation of some passages difficult. In those cases we still have the typological approach to fall back on. And so we can view the birth of Isaiah’s son in a time of trouble as a type, an image, a foreshadowing, of the birth of God’s Son in a time of trouble and global sense of preparedness for something to happen. The Flood too, can be seen as a type of global catastrophe. Powerful affirmation indeed, and certainly easier to read as a prophecy of Christ because of the exalted language. Again, however, Orthodox tradition has made creative use of this passage. The Great Compline service of Christmas combines this passage together with 8:9-10 and a few other verses to form a hymn that commands attention. The Russian tradition of singing this hymn is particularly impressive. Poetry, deep reverence and mysticism are the elements that characterize Orthodox worship at its best – and always surrounded by candlelight, incense and profound iconography. Even in our American churches which are more brightly lit than churches in the Old World, even with pews and choirs that are not always properly trained in the Orthodox ethos, services like the Great Compline of Christmas and the Liturgy of Pre-Sanctified Gifts during Lent cannot fail but impress with their deep biblical spirituality. And everywhere you look in our liturgical cycles you see this deep commitment to the use of biblical texts as types of Christ and types of our own standing before God. In the final analysis, this is the best way to read the scriptures. Jesus himself used the scriptures in this way. When he hung on the Cross, he cried out, “Eli, Eli, la′ma sabachtha′ni?” that is, “My God, my God, why have you forsaken me?” (Matthew 27:46) He quoted Psalm 22. Does this mean that Psalm 22 was written as a prophecy of Jesus Christ? Of course not. The psalm is David’s own cry to God. But Jesus put it in his own mouth in his moment of greatest suffering and made it his own. Not only the words that Jesus cried out, but Matthew also makes use of verses 7-8 of David’s psalm. So we can then say that David’s lament in Psalm 22 is a type, an image of Christ on the Cross. And Jesus is the one who enables us to make that connection! This is how typology works throughout the scriptures. It is in this sense that everything in the law, the prophets and the psalms is fulfilled in Christ (Luke 24:44). The way in which we read the Bible determines how we react to the world around us. Do we react with hope and an incentive to do what we can to relieve some of the suffering and confusion? Or do we say, “Apocalypse Now!” and all that matters is my own salvation? When I see Christ everywhere in scriptures it helps me deal even with the genocides of the Old Testament or the catastrophes of the Book of Revelation. Because when I see Christ and types of Christ everywhere I see his love and invitation to me to be compassionate. And that’s a good place to stop this long reflection today. Categories: Lenten Reflections | Tags: apocalypse, Biblical interpretation, environmental apocalypse, Noah, the Flood, the Rapture, types of Christ | Permalink.